Rarely do opportunities arise to become the custodian of a property in a spectacular location and with a fascinating past but Warren Cottage is just such an exceptional home. Nestling into the lee of the cliffs above the lovely Yealm Estuary with stunning views of the surrounding coast, the house is thought to have been used by the former Lord Revelstoke as a summer house when he entertained King Edward VII. It was also used as one of three ornamental luncheon pavilions, built at the turn of the 20th century, on the famous nine mile drive from Membland House to Noss Mayo Church when the Baring family – of banking fame – entertained the glitterati of the era. Now part of a coastal walk under the stewardship of the National Trust, this Area of Outstanding Natural Beauty is rich in wildlife and offers seclusion and accessibility, being just a few miles from the popular villages of Noss Mayo and Newton Ferrers, and a short drive from the city of Plymouth with its excellent transport links. Built from stone with a hipped slate roof typical of properties on this historic estate, the Grade II listed cottage has been carefully refurbished to make the most of the panoramic views and offers modern comforts without compromising its historic integrity. There are three reception rooms and three bedrooms plus a summerhouse all set in just over an acre of grounds. Beyond the entrance hall, with its exposed painted floor boards, is a superb sitting room which looks out to sea and the Eddystone Lighthouse. There is a feature fireplace and French doors open to the octagonal sun room which has more outstanding coastal views. In the dual aspect dining room there is the original slate flagstone flooring and a wood-burning stove sits in the fireplace. Tastefully designed to blend with the rest of the property the kitchen is well equipped with a range of quality solid oak units, a twin Belfast sink, solid granite work surfaces and integral Bosch appliances. It also has the original slate flagstone flooring. 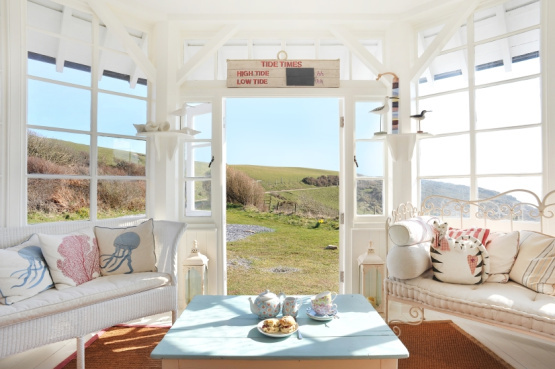 There is also a delightful snug, with sea views, and a study. Both the ground floor double bedrooms have wood flooring, the master with fabulous views, and the third bedroom is in the attic with exposed roof trusses. There is a well-appointed family bathroom plus a wet room. At the rear of the property is a secluded courtyard garden and the summer house, with its barbecue area, has been positioned to make the post of the sensational outlook along the coastline towards Rame Head. On the market through the Newton Ferrers office of Marchand Petit (01752 873311) this leasehold property has a guide price of £595,000.